It's about a boy who loves horses. But the only problem is that his dad is a Kill Buyer, who buys horses, fattens them up, and sells them to the meat market. For some reason, he always went with his father to the auctions, even though he can't bear to look at the horses in fear he might love them, and his father might buy them. That changes when one of the horses led into the ring catches the boy's eye. She was a beautiful smokey horse with dapples. Here's a passage from the book. 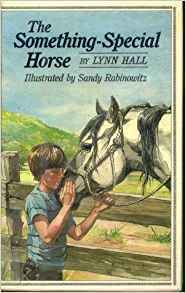 "It was a big horse,bigger then most of the scrubs that came thorough the sales barn, a gray with smoke-ring dapples and charcoal-colored mane and tail and legs. He (The boy, Chris.) could tell it was a mare, even looking down at her from this angle. There was a fine, feminine look to her head and her neck. She came in wide-eyed and staring, on tiptoe almost,ready to jump if anything came at her. She tucked her chin in, making a beautiful arch in her neck, and her tail came up in another arch. She was the most beautiful thing Chris Eklund had ever seen. This book was written by Lynn Hall. It was printed in 1985.